Love Under The Moon. For some reason I can imagine Manny spying on them. xD. 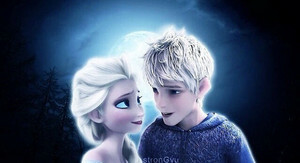 Wallpaper and background images in the Elsa & Jack Frost club tagged: photo jack frost elsa jelsa jackelsa rise of the guardians dreamworks disney frozen.